As I was walking through the campus I saw a student let out a sigh in disgust over the sight of trash around the student store. While walking, he crumpled up a piece of paper and tried to shoot it in a nearby trash can. He missed. However, rather than walk the few extra feet to pick it up and drop it in the trash, he left it. I don’t think he would appreciate it if someone left trash in his house. We spend a lot of time here at school, either attending classes or going to the library and studying. It would make it a lot easier to handle if we had a clean school to come to. Having a clean campus could help you start the school day off right. 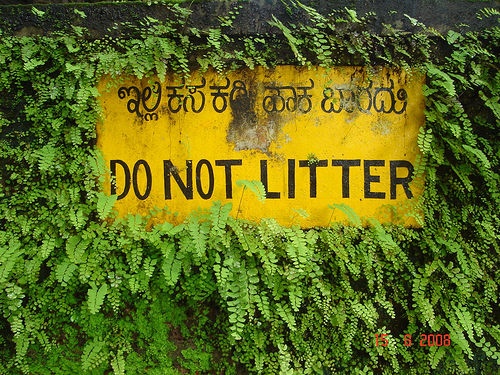 I think a clean campus would send a message around the community that we care about Manipal. There is a littering problem here on campus, but we the students are the direct cause of this problem. If everyone would pick up after themselves the campus would look a lot cleaner. For the amount of custodians here on campus they do a good job dealing with the trash. But picking up after yourself would free them to do more important jobs like fixing your hostel or other maintenance work. The next time you complain about a broken desk or a light fixture that keeps buzzing on and off. Don’t get mad because the custodians just may be busy picking up your trash.